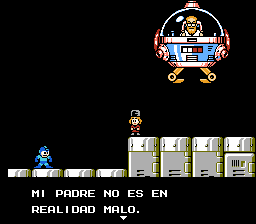 Mega Man 4 is a platforming game for the Nintendo Entertainment System. 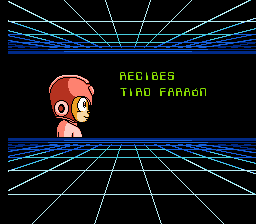 The game starts with the backstory of the original game as well as this one, which is a nice touch since Mega Man 1 had no such opening story sequence. Just like before, our hero must defeat eight robots, along with the mad scientist who created them…only this time it’s apparently a different mad scientist! 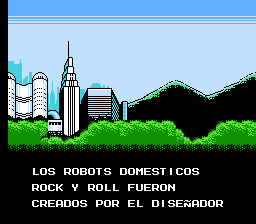 As always, when you beat a Robot Master, you gain its weapon. Each Master is weak against one of the others’ weapons. Additions from the previous entries are back, like energy tanks, Rush the robo-dog, and the ability to slide. A welcome new feature is the ability to charge your main weapon, which gives you a slight edge if you haven’t yet obtained a particular boss’s weakness. There are two new support items: the balloon and the wire. The balloon lets you create floating platforms to jump onto (just like Item 1 in Mega Man 2) and the wire latches onto the ceiling and pulls you upward. They seem a little unnecessary since Rush is still present, but they give you more options to tackle any situation. 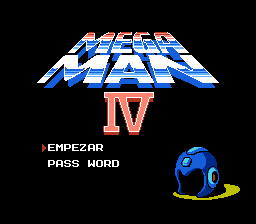 A password system is an added feature and lets you continue after defeating the 8 Robot Masters. 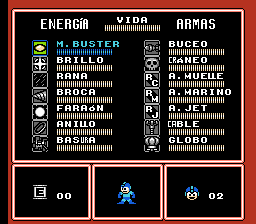 Translation to Spanish for “Megaman IV”, for the Nintendo Entertainment System.